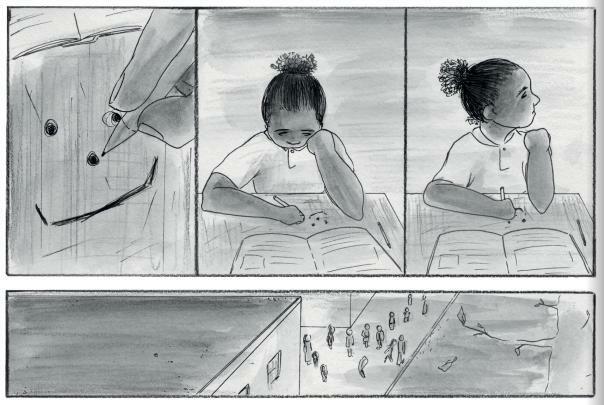 It’s been nearly three years since I first came across Rozi Hathaway’s work in the pages of Ravi Thornton’s multi-artist graphic memoir HOAX Psychosis Blues and immediately marked her out as “an artist to keep an eye out for”. 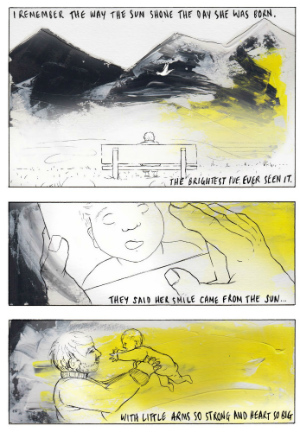 If you’re a regular Broken Frontier reader then you know the drill by now because Hathaway has been a constant presence on the site since early 2015 – firstly as part of our inaugural annual ‘Six Small Press Creators to Watch’ intake with all the coverage that entailed and, latterly, as the winner of the 2016 Broken Frontier Awards Breakout Talent category. There are few people in UK small press comics as prolific, hardworking and as dedicated to constantly improving their craft as Rozi Hathaway and it’s been a pleasure to see her storytelling abilities evolve and grow in confidence to the degree that they have in that time. All of which brings us to her new book Cosmos and Other Stories, debuting at this weekend’s Leam Comic Con from rising micropublishers Good Comics. 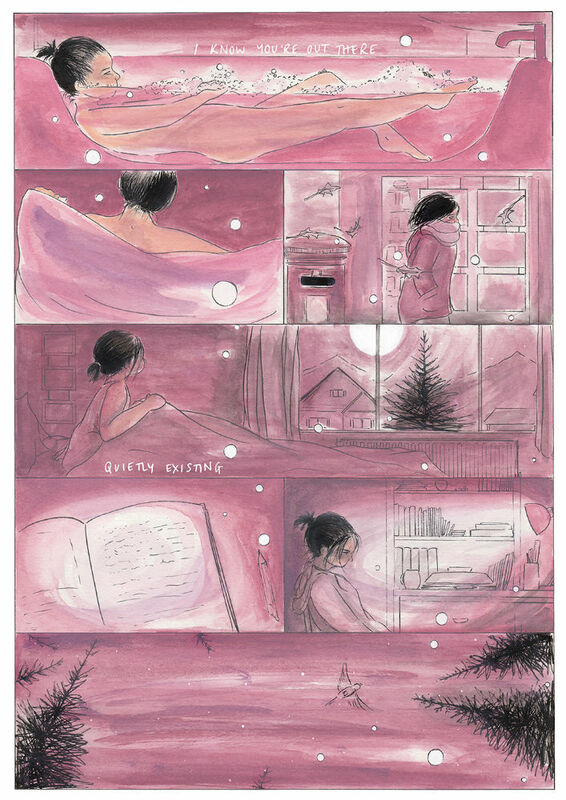 A collection of a handful of comics shorts, it’s Hathaway at her economical but profound best; a book that displays that remarkable ability she has to bring us so fully into the lives of her characters with a recognisable emotional resonance. 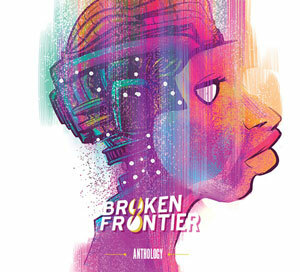 The thematic heart of Cosmos and Other Stories revolves around the concepts of loneliness, solitude, separation and loss. That can take the subtlest metaphorical form in a carefully paced meeting between birdlife in the opening entry or a more direct examination, as in the final story (bottom image on this page), wherein Hathaway returns to a familiar subject in her work – childhood isolation and the power of the imagination. Of the six stories herein one may be familiar to Dirty Rotten Comics readers as ‘Sørgedag’ originally appeared in a slightly different form in the eighth issue of that anthology. I described it here as the strongest story in that book and as “a heartrending tale of parental loss [that] almost smothers you in a choking sense of grief and loss”. It’s re-presentation here makes limited use of colour to underscore the painful poignancy that made it such an affecting read the first time around. Two stories ‘Lost in a Crowd’ and ‘A Poem’ (above right) present visuals that are linked but detached from the conversations they illustrate in order to emphasise dislocation and estrangement. In the former it acts as a reminder that while the modern world allows us a communicative immediacy with loved ones wherever we are, it’s still no substitute for a more direct interaction with those we care about. Loneliness does not always necessarily equate with solitude. 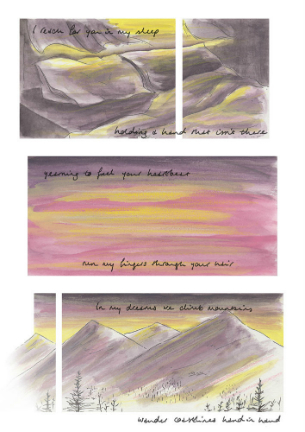 The latter is a lyrical examination of what could have been – its visual disconnection layering an extra sense of regret over its panels. It’s in that title story ‘Cosmos’ (above), though, where Hathaway shows just how eloquent an orator in the pure language of comics she has become over these last three years. Facing pages reflect the emptiness of their subject’s lives. Two yearning souls, cast apart by fate, reaching across an impossible divide for a companionship that will never come. Its final spread melts into a sense of despair and inevitability that may just be one of the finest examples of Hathaway’s exploitation of the medium I have seen to date. It’s an inspired use of those unique properties of comics and further evidence, if it were needed, of Hathaway’s ability to constantly experiment with page structure to underline the motifs of her work. As ever, her carefully selected colour palette and delicate, drifting art add to the dreamlike quality of her visual soliloquies. There’s an appropriate fragility to the pages of Cosmos & Other Stories that sublimely reflects its heartfelt subject matter. Cosmos & Other Stories isn’t a comic you read. It’s a comic you feel. A simple statement, perhaps, but one that fully embodies the empathetic power of Rozi Hathaway’s storytelling. Discover more about Rozi Hathaway’s work on her site here and follow her on Twitter here. 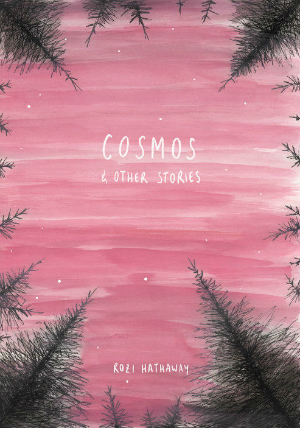 You can pre-order Cosmos & Other Stories from Good Comics here and follow them on Twitter here.